We love our cats like we love our gardening. And we like our cats big, just as we like our veggies. 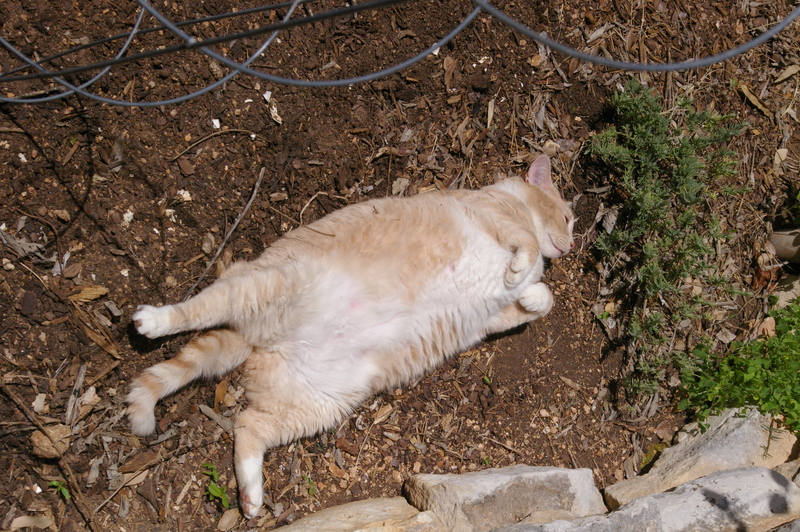 Of our two cats, Butterball (or Butters for short) is a much better “garden cat” than Maya. A good garden cat is one that hangs by your side while you’re working in the yard, doesn’t get scared off by the slightest sound, and keeps other creatures away that may want to eat your veggies before you do. Typically, Butterball is good garden cat. Here is one exception. Actually, I lied. Here’s another exception. This may be turning into a habit. Can you blame him though? Sleeping or sunbathing? Or both? 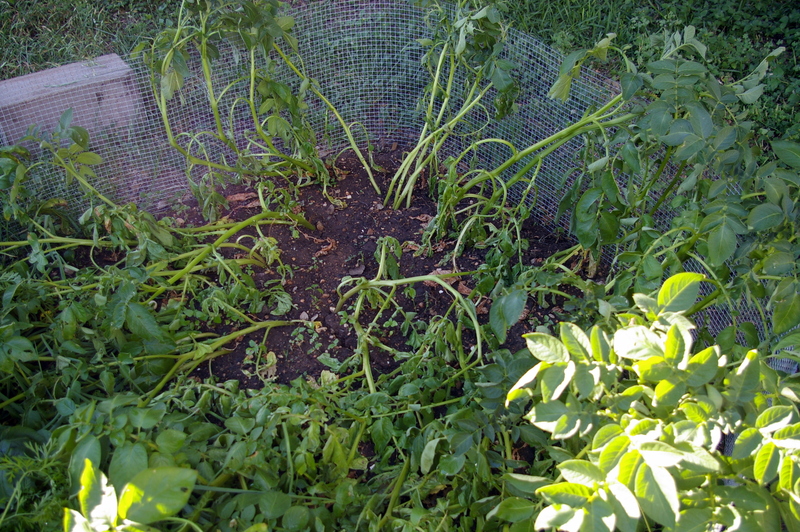 Whatever he’s doing, it’s not stopping whatever is trampling our potato plants and eating our cabbage. Despite our small barrier around the bed, something managed to get in. I propped the stems back up as best I could and pulled one stalk out to see how things were going. 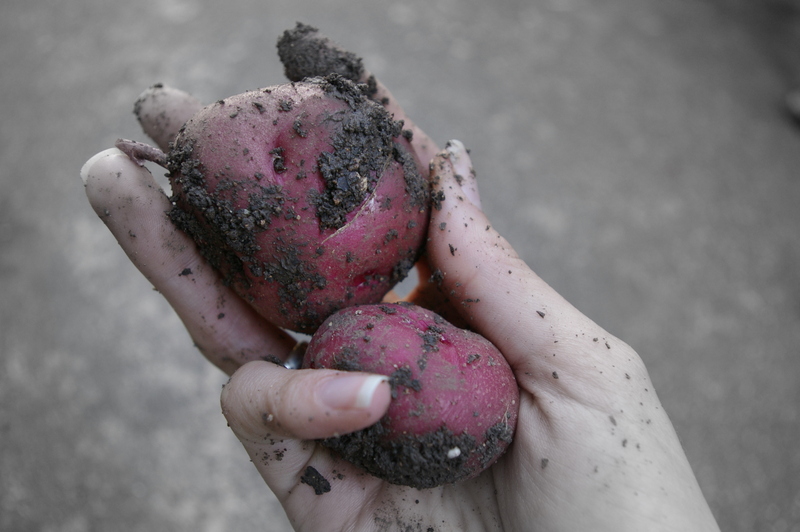 The red potatoes are looking good — one was still a bit small. I didn’t check the gold potatoes. Thought I’d better leave them alone. Bottom line is, cats have a great life. And whether or not they’re sleeping or sunbathing, I’d love their company in the garden any time. I couldn’t believe my eyes! There it was. Sitting on one of the lowest limbs of the plant, close to the ground. Our very first tomato of the year. For any gardener, this is quite a joyous occassion. 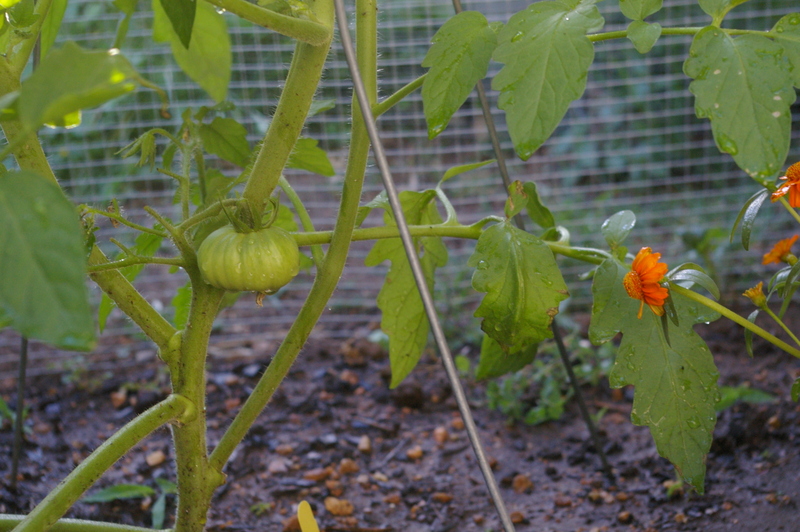 Now I will carefully protect this little tomato from squirrels, birds, bugs, and horn worms as best I can (until I eat it myself of course). 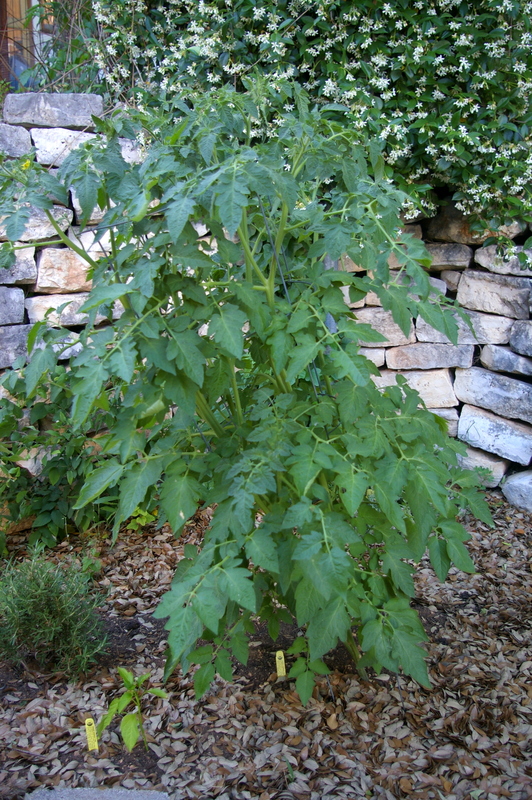 Perhaps these plants are doing well because we learned a new tomato planting technique this year while volunteering for Green Corn Project. (The nice spring weather and rain can’t hurt either.) 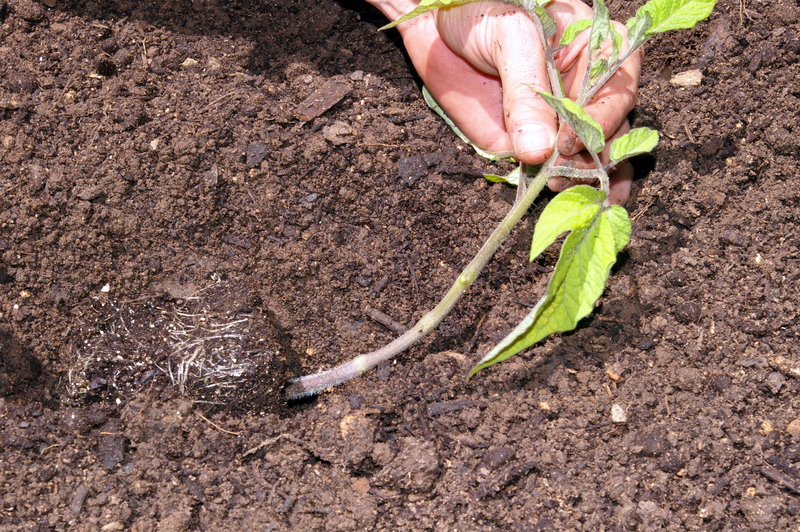 Basically, you plant the tomato on its side, covering a good portion of the stem, to establish a better root structure. 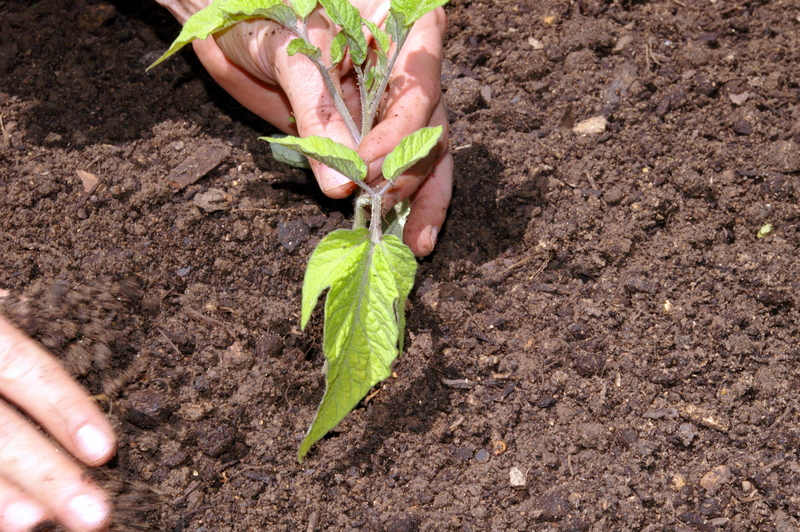 Before doing this, pluck off some of the small leaves toward the base of the stem. Those nodes you just plucked off will become a part of the root structure (nodes under ground = roots; nodes above groud with sunlight = leaves/stems). 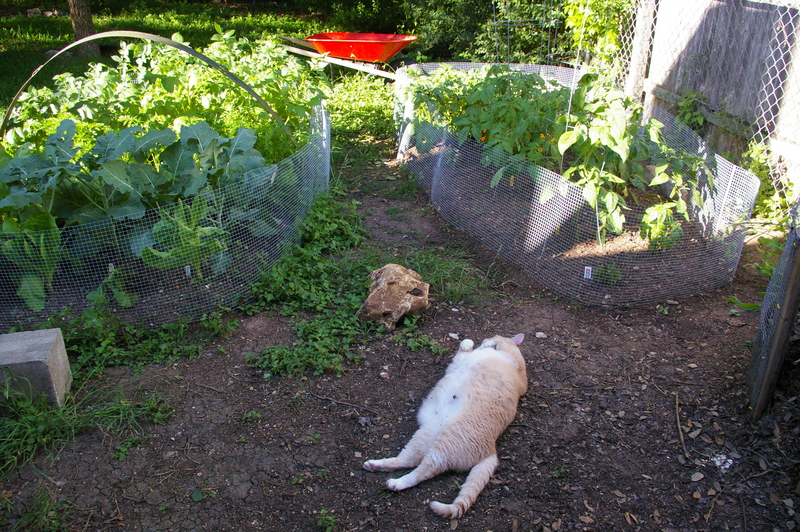 Next up on the blog: What happens when cats sleep on garden duty?